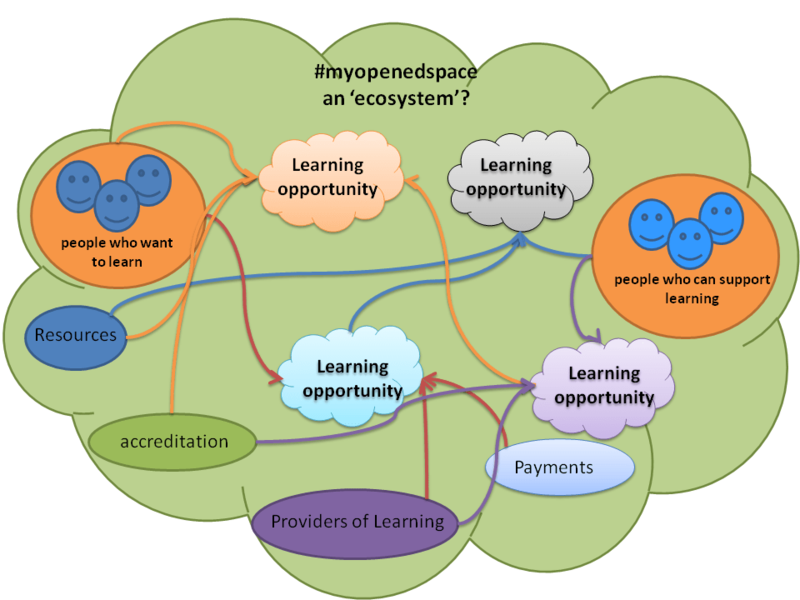 In the ‘open’ model below, an ecosystem exists where learning providers, accreditation bodies and, for example, professional associations exist within an ecosystem with the learners and people who can support learners and appropriate tools, such as open resources and the ability to make payments (either real, or in kind) if appropriate. The ecosystem, under the right conditions, enables learning opportunities to flourish using all or some of the constituent parts, where learning can be accredited or non accredited, formal or informal, free or paid, and a variety of other options. The important part is that the ecosystem is open and transparent. The openness allows broad and diverse access, which leads to greater resource. The transparency is important so that the connections and diversity of leaning opportunity can be seen by all and either replicated or modified. Connectivism, Open #openedspace, #openeducationwk. permalink. This looks as if it is a self-organising organic system – how would you fit the idea of the planned curriculum in to this model? Or are you seeing a variable granularity to your “learning opportunities”. It’s a great model, loads of stuff to tease out. Looks a bit like Illich’s Four Networks, though more explicitly a marketplace (cf Christopher Alexander). I can see how some parts of the network are almost in place – standards for the “products” (learning opportunities and learning resources).